U.S. Attorney General Jeff Sessions gestures during a Thursday news conference at the Moakley Federal Building in Boston. Sessions is defending his top deputy after some Congressional Republicans moved to impeach him. Sessions said Thursday in Boston that he has the "highest confidence" in Deputy Attorney General Rod Rosenstein. He suggested lawmakers instead focus on reforming the nation's immigration system. BOSTON — U.S. Attorney General Jeff Sessions defended his top deputy Thursday after a handful of congressional Republicans moved this week to impeach him. Speaking in Boston, Sessions said he has the “highest confidence” in Deputy Attorney General Rod Rosenstein and described him as “highly capable” when asked about the impeachment effort. A group of 11 House conservatives on Wednesday introduced articles of impeachment against Rosenstein, who oversees Special Counsel Robert Mueller’s Russia investigation because Sessions has recused himself. 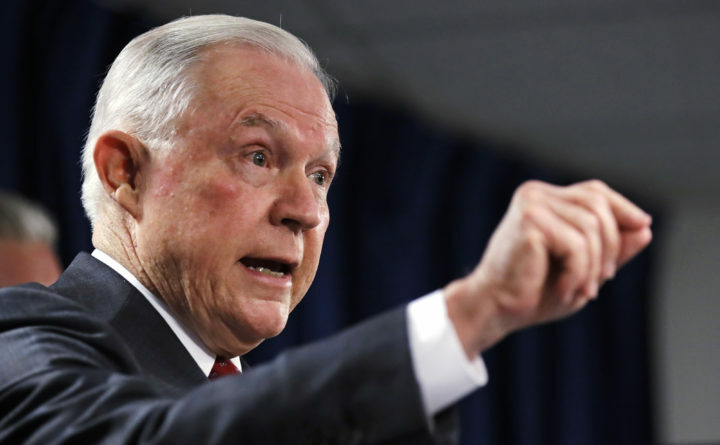 Sessions, a former Republican senator from Alabama, suggested lawmakers should instead focus on “legal challenges,” such as reforming the nation’s immigration system. Republican House Speaker Paul Ryan also said Thursday he doesn’t support the impeachment effort. The House conservatives accuse Rosenstein of failing to provide information to House committees, even though the Justice Department has already provided more than 800,000 documents. They also accuse Rosenstein of signing off on what they say was improper surveillance of a Trump adviser. Sessions also expressed regret for having laughed at a “Lock Her Up” chant and repeated the words during a speech Tuesday at a high school leadership summit in D.C.
“I perhaps should have taken a moment to advise them on the fact that you’re presumed innocent until cases are made,” he said when asked to comment on the chant, which is a staple of President Donald Trump’s campaign rallies. The chant refers to the FBI investigation of Democrat Hillary Clinton’s use of a private email server during her tenure as secretary of state under former President Barack Obama. And Sessions acknowledged that states like Massachusetts that have legalized recreational use of marijuana have the right to craft their own laws around the drug, but stressed his agency will continue to enforce federal law, which considers it an illegal substance. “Personally my view is that the American republic will not be better if there are marijuana sales on every street corner but states have a right to set their own laws and will do so,” Sessions said. Sessions was in Boston federal court Thursday to join U.S. Attorney for Massachusetts Andrew Lelling and other federal authorities in announcing 25 arrests in a federal sweep meant to crack down on document and benefit fraud. Thursday’s arrests swept up mostly Dominican nationals living in the country illegally. Prosecutors say many stole the identities of U.S. citizens in Puerto Rico in order to receive health care and other federal benefits in Massachusetts. Sessions said the actions defrauded the federal government of about $250,000 and that many of the suspects had criminal records, including a convicted murderer who escaped from prison in Puerto Rico 24 years ago. He said the arrests highlight the need for tougher immigration enforcement.